I've been crushing on The Others series since Written in Red. While I was patiently waiting for another story about Simon Wolfguard and Meg Corbyn, Anne Bishop decided to introduce Vicki De Vine and a slew of new and interesting Others. 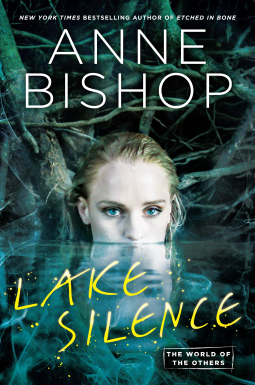 I begrudgingly admit that Lake Silence pulled on my heartstrings a bit, and I'm dying for more! Vicki is the new owner and caretaker of a bed and breakfast, called The Jumble, in a human town controlled by the Others. She doesn't know that there are evil, greedy forces waiting to pounce and take away everything she's worked for. Thankfully, her compassion for the young Aggie Crowe, and other Others she comes across, endear her to the terra indigene leaders and gains her some kind of protection from the Elders. Yes, I was a little depressed to not get more of Meg and Simon, but Lake Silence has offered a different vibe that makes this story an asset. All the stories up to this point have touches of dark humor, but I found many more laugh out loud moments paired with the violence of life with man-eating creatures. Vicki may struggle with insecurity and anxiety, but her snark and sass come through loud and clear. She finds her voice by the end of the novel and I love her just as much as I love Meg! There are quite a few compelling human characters that also have backgrounds that make them different from the rest of the population. Events in the Lakeside Courtyard are creating a wave of change in the rest of the world and it's characters like Vicki, Officer Grimshaw, and Julian, who do what they can to keep the terra indigene from wiping out the entire population of humans. I can safely say that I have no idea where this series is going, but I'm behind Anne Bishop 100%! With Lake Silence, she's opened up the world of the Others to our prying eyes and I can't wait to travel a bit further into this fantastical land!